This stunning handmade dress is part of the 2016 Echo collection from London designer Emma Hunt. The dress is made from 100% silk, it is double lined with 100% silk also which adds to its luxurious feel and fit. The dress has delicate finishing touches such as appliqued corded lace and Chantilly eyelash trims, along with delicate beaded embellishments. 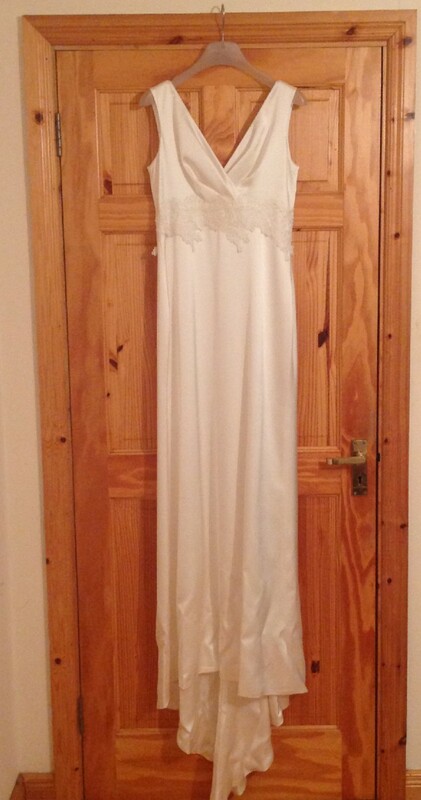 The dress is a beauftiful fit and gives a flattering silhouette, it was just recently collected from Myrtle Ivory beautique, Dublin, which is the only bridal shop in Ireland that stocks Emma Hunt designs. The dress itself has never been tried on or altered in any way. Please excuse the minor wrinkling at the base of the dress from the shop carrier bag- I did not want to tamper with the dress but this would be easily rectified once the dress is altered/steamed professionally for the big day! I would love to see this dress get the day out it deserves! I'm happy to answer any questions/follow up with further pictures if needed!